Many women desire lush, darker eyelashes when they are out on the town or presenting in front of colleagues. In each case, looking their best is a high priority to help them feel confident. Unfortunately, this often means spending more time in front of a mirror each morning, because many eyelashes are light-colored, sparse, and/or short…all of which mean they need that little extra boost. If this sounds like you, don’t worry. Put that mascara, eyelash curler, and fake daily lashes aside, because as a licensed cosmetologist and esthetician, I have four great eyelash treatments to help you save time and money while still looking your best. 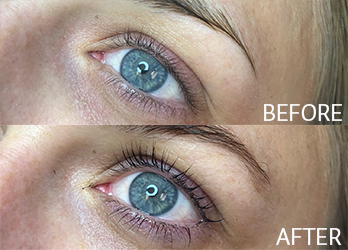 Eyelash tinting is a quick, hassle-free solution for darkening existing upper and lower lashes. 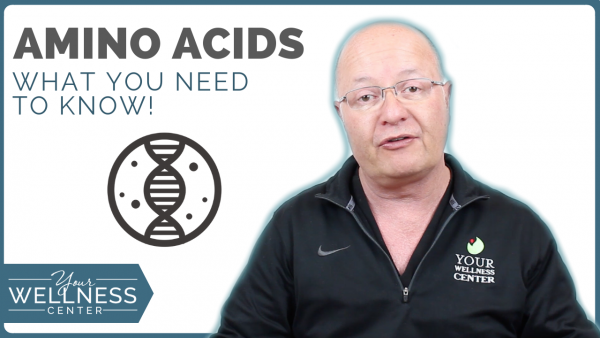 The dye is semi-permanent, so the benefits last a few weeks! Commitment: Low. No downtime, no at-home maintenance required. Simply stop in every 3-4 weeks for a 15-minute touch-up. Results: Immediate! This is the most natural-looking option for both your upper and lower lashes. Tinting is the best option for women who have light-colored lashes that are already long. In other words, if you use natural-looking mascara for darkness rather than length or volume, this is for you! Plus, you’ll save a few extra minutes each morning. Want to know more? 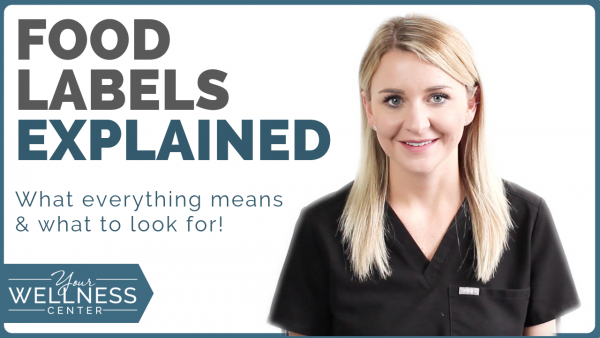 Check out this video where I talk more about tinting! The next step up from tinting is the lift. It’s an easy solution for women who want to darken and curl their existing upper lashes. Just like the regular tint, this is a semi-permanent option. Commitment: Low. No downtime, no at-home maintenance required. Simply stop in every 3-4 weeks for a 45-minute touch-up. Results: Immediate! This option is still very natural-looking, but it has a little more oomph than the regular lift. Unlike the tint, the curl is only for the upper lashes. Tinting with a lift is the best option for women who have light-colored lashes that aren’t noticeable or as curly as they want them to be. So if you’re using mascara to color and curl your lashes, this is the treatment you’ll want to try. It’s less expensive and lower maintenance than extensions, but the results are also more noticeable than the regular tint. 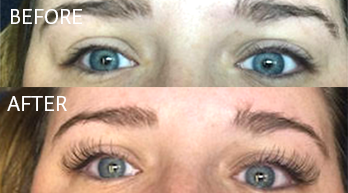 Eyelash extensions are the final option for darker eyelashes. Unlike the first three, extensions add synthetic or natural materials to your lashes to enhance the appearance (darker, longer, fuller, thicker, and curlier). Cost: $170 for our Classic Lashes, or $200 for the Volume Lashes. Refill prices depend on lash type and how often you need them refilled. Commitment: High. No downtime, but at-home maintenance is required to keep your lashes healthy and thick. The initial session takes 2 hours, but each touchup only takes an hour. Results: Immediate! This is the wow! factor option that women dream about. Like the lift, it is only for the upper lashes. Eyelash extensions are the best option for women who want to go “all in” with their lashes and ditch the mascara, lash curler, and daily fake lashes every morning. It is possible to wake up with natural-looking or luxurious lashes! Want to know more? Check out this video where I talk more about tinting! Latisse is a prescription solution that is applied every night to naturally grow longer, thicker, and darker eyelashes in 16 weeks. Commitment: High. This is an ongoing prescription that must be applied daily at home. Results: 16 weeks. This is the most natural treatment, as it enhances the growth and color of your own existing upper lashes. Tinting is the best option for women who have Hypotrichosis (inadequate or not enough eyelashes), but it also works for women who want to ditch natural-looking mascara. Want to know more? 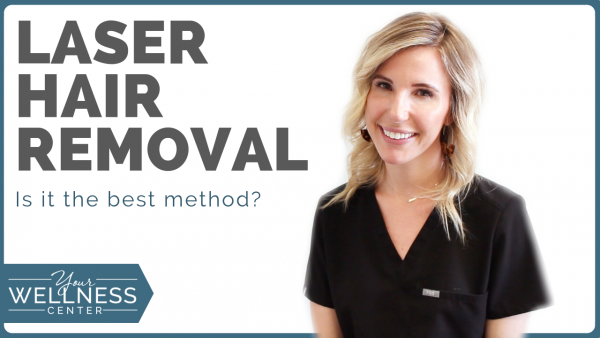 Check out this video where Kaitlyn talks more about Latisse! 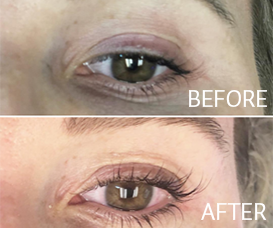 If you are interested in any eyelash service but are unsure where to start, I always recommend the simple tint or Latisse first, depending on how quickly you want to see results. Both give you the chance to test out a new look without the fear of going “overboard”. However, if you want more of a wow! Factor, we can test out lifts or extensions. Ready to dip your toes in? Give us a call at 513-791-9474 to schedule a free consultation or to book your first treatment!